A free-to-play ARPG (Diablo-like) sounds like a terrible idea on paper, mostly due to the track record of microtransactions recently and the obvious exploitation potential of a loot-heavy genre. Enter Grinding Gear Games who, despite this set up, have beautifully married to two pieces together to create a wonderful whole in Path of Exile. The result is a truly free-to-play unique romp through a carefully crafted an interesting universe. But beware! True enjoyment will demand patience and dedication from all who enter. 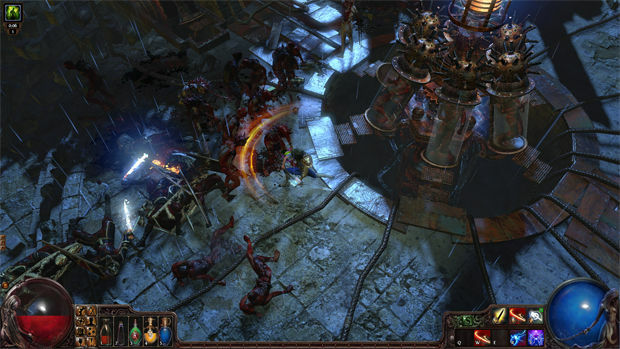 The very beginning of Path of Exile will immediately make seasoned veterans of the ARPG genre feel at home. Picking a class, the clicky-click nature of the combat, the Tetris-style inventory management, the dark atmosphere, and even one of the early quests that has players killing every last monster inside a sort of "den" filled with monsters that you might call...evil. It's a clear homage to the all-time classic, Diablo II, but an homage is all it is. 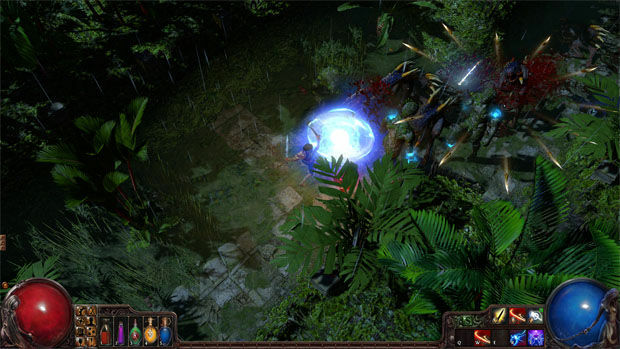 Path of Exile is very much its own game, which becomes apparent the first time players encounter the passive skill tree. It's impossible not to get lost in it. Some players will be reminded of the Sphere Grid from Final Fantasy X, others will just spend time being lost in its vast amount branches and nodes. Where to start? Where to end? What the hell am I doing? It's overwhelming to say the least, and it is pretty much a given that each player's first character will end up being relatively useless as they struggle to navigate a decent path through the skill tree. However as time goes by, mistakes are made and enough knowledge is gained to maybe eventually actually create a halfway decent character that feels unique. In fact, studying skill tree builds has become a small hobby of mine since the game's release. I love seeing all of the various builds that players create and, more importantly, their reasoning as to why they took certain nodes over others. It's not something I expect to be able to do any time soon, but understand why decisions are made helps me think more clearly when it comes time for me to make a decision in my skill tree. That's only the passive skills. The active skills operate on an entirely different mechanic, which is actually more similar to the Materia system in Final Fantasy VII. Skills are loot. Yes, you read that correctly, skills are drops in the game just like a character's gear. Once a player has a skill gem, it can be inserted into the appropriately colored socket (red, green, or blue) in a piece of gear. When a player has a piece of gear with a skill gem in it equipped, the player can then use that skill. It's a very simple mechanic that allows for a ton of freedom when building a character, and places a lot more emphasis on gear sockets instead of all the emphasis being placed on the gear's stats. Things get a tad more complicated when support gems are introduced. Support gems add an extra effect onto a skill gem. 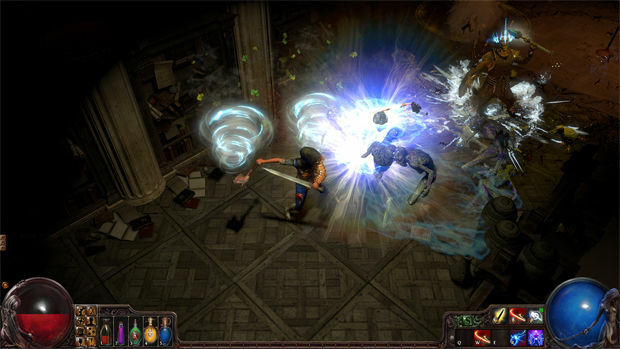 For example, it is possible to link together a Melee Splash support gem onto a single-target melee skill, and suddenly it is an area of effect attack. It is also possible to attach a spell skill gem to the Remote Mine support gem and create a Remote Mine that can be detonated to use whatever spell you attacked the support gem to. Support gems must be linked to a skill gem through gear, however. In other words, the sockets in the gear must be the appropriate colors and be connected together in order to create certain combinations. Combining both the passive skill tree and the gem system allows some of the strangest and unique builds ever encountered in the genre. If you thought creating a Barbarian that uses throwing weapons was unique in Diablo II, you ain't seen nothing yet. It's possible to do just about anything with enough dedication. Like a particular skill a whole bunch? Do some research and create a character build entirely around that skill. Chances are, it might not be terrible! But also, it could be terrible. It's probably terrible. Ah, but I've gotten ahead of myself here. There are six different classes with a seventh unlockable after playing through the game once. Each has their own dominant statistics, either strength, dexterity, intelligence, or some combination thereof. Thanks to the freedom from the various skill mechanics, there is nothing saying that a Marauder, whose primary stat is strength, can't be turned into a semi-decent spell caster. No, he'll never be as good as the Witch, but the fact that it is even possible is a testament to the malleability of classes in Path of Exile. Combat is your traditional ARPG mouse-clicking fare. Click to move, click to attack, click and key to use abilities. If you've played any ARPG ever, you know exactly what you're getting into. It rarely gets boring, since the difficulty starts relatively high and tends to keep players on their toes in order to avoid death. Players who can't stand clickity-click clicking away in other games of the genre won't have their minds changed here, but fans of past games will be able to feel right at home. 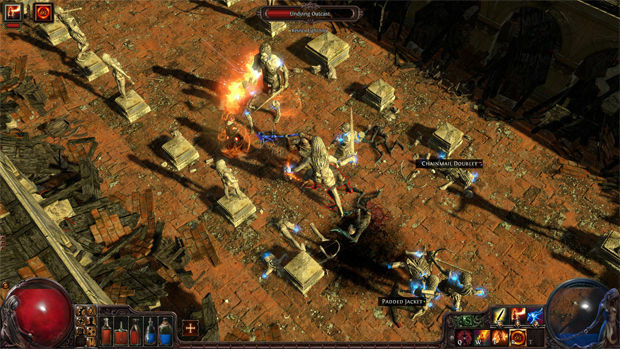 There is a slow grind to Path of Exile. For some, it may be go unnoticed. For others, it will be all they notice. As mentioned, the first, and possibly second, character are almost guaranteed to be failures. The main three acts will take players some time to get through on the default difficulty, and then there are two more difficulties to conquer while repeating the acts. Support gems are trickled in slowly, and going node by node on the passive skill tree can start to feel like no progress is being made at all sometimes. Path of Exile is most definitely a game that requires some patience from the player in order to give it some time to bloom. Speaking of the three acts, there's a story in Path of Exile that focuses around the player -- the "exile." It's a serviceable story to say the least, but the world around it is far more interesting. Grinding Gear Games has slowly been adding in more and more lore as the game continues to evolve, mostly in the form of readable stone slabs out in the wilderness, which have really helped to expand upon this dark and gloomy universe. My absolute favorite part of Path of Exile is its economy. I know that sounds boring, but I'm into this kind of stuff, alright? There is no gold in Path of Exile, just items. Buying items from NPC vendors requires players to use a bartering system. Want a new item? That'll be one Armorer's Scrap, please! You're selling all those? I can give you an Identification Scroll for your troubles! It's so perfect since the same idea is what dictates the player's economy. There's no gold auction house where a player can easily buy everything they need; they must do research as to its value and also research what type of currency is worth the most. It's absolutely brilliant. When you're not utterly absorbed in creating new builds or leveling up a character, there are plenty of distractions available. Player versus Player (PvP) combat is available and plays as you would expect, but that's not all. There is a constant stream of what they call "races," which are timed runs through the game. Each race has its own rules, like having projectiles deal no damage, enemies attack faster, and forcing players to play solo or in a party. Doing well (really well) in these races awards players points which can then be redeemed for super-ultra-special unique items. Path of Exile also has an interesting endgame. 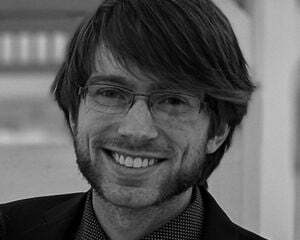 The endgame content focuses squarely on "maps." They function like loot -- they have a quality that can be improved, and affixes that can be added to increase the difficulty and rewards. Maps have a huge range of possibilities, and it can be exciting to see what kind of combinations come up. It also helps prevent against running Mephisto or the Cow Level over and over and over and over and over and over again until you are physically and mentally dead. Which is nice. 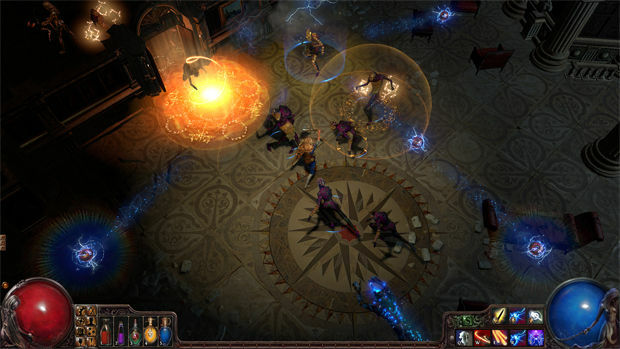 Path of Exile has a free-to-play model on par with any Valve free-to-play game. The game is free. Simple as that! You can buy plenty of aesthetic items and extra slots for your stash, which still doesn't affect gameplay. The game and everything associated with it, costs you nothing but Internet and time. It's the kind of game that doesn't beg the player for money at seemingly every turn but instead, earns any money it makes through amazing developer feedback and player guilt. It really feels like stealing when playing Path of Exile, since it's such a high quality product for no cost whatsoever. Due to its free-to-play model, the game can only be played while connected to the Internet. It's a bit of a shame, absolutely, not to be able to play a quality game like this at any point in time, but the tradeoff is a real free-to-play game with a real living and breathing economy. Personally, I'm okay with that. The game's aesthetic also deserves praise. The world has a grimy, grungy, uncomfortable feel to it that constantly makes the player feel slightly off just for inhabiting it, which is appropriate given what goes on. Every person and object looks like it's at its lowest point. Enemy design is equally morbid, though it does tend to fall back on enemies like skeletons and more skeletons. Combat can certainly pack a punch, though animations do tend to feel disjointed, which can lead to a feeling of clunkiness. The art style and design on the loot garners a special mention from me, since it brings me back to my Diablo II days of looking at Sigon's Shield, SOJs, and Windforces. It's just so damn nostalgic I can't take it. Path of Exile is free (actually free), unique, and exciting, despite its often morose tone and themes. I don't have much else to say except GO DOWNLOAD IT!